Incense can generally be separated into two main types: "indirect-burning" and "direct-burning". Indirect-burning incense (or "non-combustible incense") is not capable of burning on its own, and requires a separate heat source. 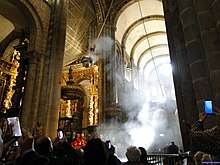 Direct-burning incense (or "combustible incense") is lit directly by a flame and then fanned or blown out, leaving a glowing ember that smoulders and releases a smoky fragrance. Direct-burning incense is either a paste formed around a bamboo stick, or a paste that is extruded into a stick or cone shape. The word incense comes from Latin incendere meaning "to burn". Brought to Japan in the 6th century by Korean Buddhist monks, who used the mystical aromas in their purification rites, the delicate scents of Koh (high-quality Japanese incense) became a source of amusement and entertainment with nobles in the Imperial Court during the Heian Era 200 years later. During the 14th-century Ashikaga shogunate, a samurai warrior might perfume his helmet and armor with incense to achieve an aura of invincibility (as well as to make a noble gesture to whoever might take his head in battle). It wasn't until the Muromachi period during the 15th and 16th century that incense appreciation (kōdō) spread to the upper and middle classes of Japanese society. Incense is available in various forms and degrees of processing. They can generally be separated into "direct-burning" and "indirect-burning" types. Preference for one form or another varies with culture, tradition, and personal taste. The two differ in their composition due to the former's requirement for even, stable, and sustained burning. Indirect-burning incense, also called "non-combustible incense", is an aromatic material or combination of materials, such as resins, that does not contain combustible material and so requires a separate heat source. Finer forms tend to burn more rapidly, while coarsely ground or whole chunks may be consumed very gradually, having less surface area. Heat is traditionally provided by charcoal or glowing embers. In the West, the best known incense materials of this type are the resins frankincense and myrrh, likely due to their numerous mentions in the Bible. [original research?] Frankincense means "pure incense", though in common usage refers specifically to the resin of the boswellia tree. 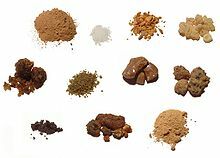 Paste: Powdered or granulated incense material is mixed with a sticky incombustible binder, such as dried fruit, honey, or a soft resin and then formed to balls or small pastilles. These may then be allowed to mature in a controlled environment where the fragrances can commingle and unite. Much Arabian incense, also called "Bukhoor" or "Bakhoor", is of this type, and Japan has a history of kneaded incense, called nerikō or awasekō, made using this method. Within the Eastern Orthodox Christian tradition, raw frankincense is ground into a fine powder and then mixed with various sweet-smelling essential oils. Direct-burning incense, also called "combustible incense",[better source needed] is lit directly by a flame. 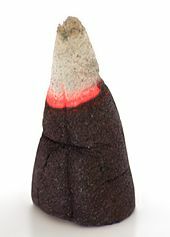 The glowing ember on the incense will continue to smoulder and burn the rest of the incense without further application of external heat or flame. Direct-burning incense is either extruded, pressed into forms, or coated onto a supporting material. This class of incense is made from a moldable substrate of fragrant finely ground (or liquid) incense materials and odourless binder. The composition must be adjusted to provide fragrance in the proper concentration and to ensure even burning. The following types are commonly encountered, though direct-burning incense can take nearly any form, whether for expedience or whimsy. 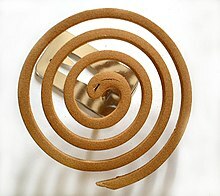 Cored stick: A supporting core of bamboo is coated with a thick layer of incense material that burns away with the core. Higher-quality variations have fragrant sandalwood cores. This type of incense is commonly produced in India and China. 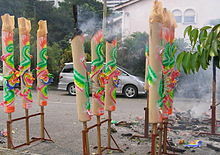 When used in Chinese folk religion, these are sometimes known as "joss sticks". Paper: Paper infused with incense, folded accordion style, is lit and blown out. Examples include Carta d'Armenia and Papier d'Arménie. 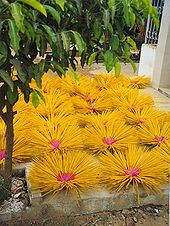 Incense sticks may be termed joss sticks, especially in parts of East Asia, South Asia and Southeast Asia. Among ethnic Chinese and Chinese-influenced communities these are traditionally burned at temples, before the threshold of a home or business, before an image of a religious divinity or local spirit, or in shrines, large and small, found at the main entrance of every village. Here the earth god is propitiated in the hope of bringing wealth and health to the village. They can also be burned in front of a door or open window as an offering to heaven, or the devas. The word "joss" is derived from the Latin deus (god) via the Portuguese deos through the Javanese dejos, through Chinese pidgin English. The raw materials are powdered and then mixed together with a binder to form a paste, which, for direct burning incense, is then cut and dried into pellets. Incense of the Athonite Orthodox Christian tradition is made by powdering frankincense or fir resin, mixing it with essential oils. Floral fragrances are the most common, but citrus such as lemon is not uncommon. The incense mixture is then rolled out into a slab approximately 1 cm thick and left until the slab has firmed. It is then cut into small cubes, coated with clay powder to prevent adhesion, and allowed to fully harden and dry. In Greece this rolled incense resin is called 'Moskolibano', and generally comes in either a pink or green colour denoting the fragrance, with pink being rose and green being jasmine. Oil content: an excess of oils may prevent incense from smoldering effectively. Resinous materials such as myrrh and frankincense are typically balanced with "dry" materials such as wood, bark and leaf powders. Binder: Water-soluble binders such as "makko" ensure that the incense mixture does not crumble when dry, dilute the mixture. "Dipped" or "hand-dipped" direct-burning incense is created by dipping "incense blanks" made of unscented combustible dust into any suitable kind of essential or fragrance oil. These are often sold in the United States by flea-market and sidewalk vendors who have developed their own styles. This form of incense requires the least skill and equipment to manufacture, since the blanks are pre-formed in China or South East Asia. Traditionally, the bamboo core of cored stick incense is prepared by hand from Phyllostachys heterocycla cv. pubescens since this species produces thick wood and easily burns to ashes in the incense stick. 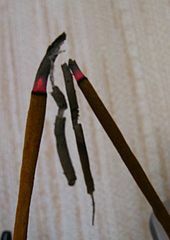 In a process known as "splitting the foot of the incense stick", the bamboo is trimmed to length, soaked, peeled, and split in halves until the thin sticks of bamboo have square cross sections of less than 3mm. This process has been largely replaced by machines in modern incense production. In most Arab countries, incense is burned in the form of scented chips or blocks called bakhoor (Arabic: بخور‎ [bɑˈxuːɾ, bʊ-]. Incense is used on special occasions like weddings or on Fridays or generally to perfume the house. The bakhoor is usually burned in a mabkhara, a traditional incense burner (censer) similar to the Somali Dabqaad. It is customary in many Arab countries to pass bakhoor among the guests in the majlis ('congregation'). This is done as a gesture of hospitality. Along with the introduction of Buddhism in China came calibrated incense sticks and incense clocks. The first known record is by poet Yu Jianwu (487-551): "By burning incense we know the o'clock of the night, With graduated candles we confirm the tally of the watches." The use of these incense timekeeping devices spread from Buddhist monasteries into Chinese secular society. The basic ingredients are the bamboo stick, the paste (generally made of charcoal dust and joss/jiggit/gum/tabu powder – an adhesive made from the bark of litsea glutinosa and other trees), and the perfume ingredients - which would be a masala (spice mix) powder of ground ingredients into which the stick would be rolled, or a perfume liquid sometimes consisting of synthetic ingredients into which the stick would be dipped. Perfume is sometimes sprayed on the coated sticks. Stick machines are sometimes used, which coat the stick with paste and perfume, though the bulk of production is done by hand rolling at home. There are about 5,000 incense companies in India that take raw unperfumed sticks hand-rolled by approximately 200,000 women working part-time at home, and then apply their own brand of perfume, and package the sticks for sale. An experienced home-worker can produce 4,000 raw sticks a day. There are about 50 large companies that together account for up to 30% of the market, and around 500 of the companies, including a significant number of the main ones, including Moksh Agarbatti and Cycle Pure, are based in Mysore. Tibetan incense refers to a common style of incense found in Tibet, Nepal, and Bhutan. These incenses have a characteristic "earthy" scent to them. Ingredients vary from cinnamon, clove, and juniper, to kusum flower, ashvagandha, and sahi jeera. Agarwood (沈香 Jinkō) and sandalwood (白檀 byakudan) are the two most important ingredients in Japanese incense. Agarwood is known as "jinkō" in Japan, which translates as "incense that sinks in water", due to the weight of the resin in the wood. Sandalwood is one of the most calming incense ingredients and lends itself well to meditation. It is also used in the Japanese tea ceremony. The most valued Sandalwood comes from Mysore in the state of Karnataka in India. 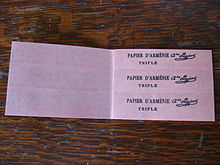 Papier d'Armenie was used to disinfect. A similar utilitarian use of incense can be found in the post-Reformation Church of England. Although the ceremonial use of incense was abandoned until the Oxford Movement, it was common to have incense (typically frankincense) burned before grand occasions, when the church would be crowded. The frankincense was carried about by a member of the vestry before the service in a vessel called a 'perfuming pan'. In iconography of the day, this vessel is shown to be elongated and flat, with a single long handle on one side. The perfuming pan was used instead of the thurible, as the latter would have likely offended the Protestant sensibilities of the 17th and 18th centuries. Papier d'Arménie was originally sold as a disinfectant as well as for the fragrance. 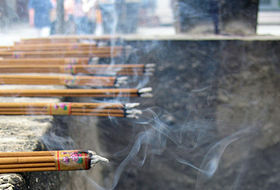 Religious use of incense is prevalent in many cultures and may have roots in the practical and aesthetic uses, considering that many of these religions have little else in common. 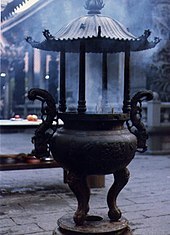 One common motif is incense as a form of sacrificial offering to a deity. Such use was common in Judaic worship and remains in use for example in the Catholic, Orthodox, and Anglican churches, Taoist and Buddhist Chinese jingxiang (敬香 "offer incense [to ancestors/gods]), etc. Aphrodisiac Incense has been used as an aphrodisiac in some cultures. Both ancient Greek and ancient Egyptian mythology suggest the usage of incense by goddesses and nymphs. Incense is thought to heighten sexual desires and sexual attraction. Time-keeper Incense clocks are used to time social, medical and religious practices in parts of eastern Asia. They are primarily used in Buddhism as a timer of mediation and prayer. Different types of incense burn at different rates; therefore, different incense are used for different practices. The duration of burning ranges from minutes to months. Healing stone cleanser Incense is claimed to cleanse and restore energy in healing stones. The technique used is called “smudging” and is done by holding a healing stone over the smoke of burning incense for 20 to 30 seconds. Some people believe that this process not only restores energy but eliminates negative energy. In contrast, epidemiologists at the Hong Kong Anti-Cancer Society, Aichi Cancer Center in Nagoya, and several other centers found: "No association was found between exposure to incense burning and respiratory symptoms like chronic cough, chronic sputum, chronic bronchitis, runny nose, wheezing, asthma, allergic rhinitis, or pneumonia among the three populations studied: i.e. primary school children, their non-smoking mothers, or a group of older non-smoking female controls. Incense burning did not affect lung cancer risk among non-smokers, but it significantly reduced risk among smokers, even after adjusting for lifetime smoking amount." However, the researchers qualified their findings by noting that incense burning in the studied population was associated with certain low-cancer-risk dietary habits, and concluded that "diet can be a significant confounder of epidemiological studies on air pollution and respiratory health." Although several studies have not shown a link between incense and lung cancer, many other types of cancer have been directly linked to burning incense. [specify] A study published in 2008 in the medical journal Cancer found that incense use is associated with a statistically significant higher risk of cancers of the upper respiratory tract, with the exception of nasopharyngeal cancer. Those who used incense heavily also were 80% more likely to develop squamous-cell carcinomas. The link between incense use and increased cancer risk held when the researchers weighed other factors, including cigarette smoking, diet and drinking habits. The research team noted that "This association is consistent with a large number of studies identifying carcinogens in incense smoke, and given the widespread and sometimes involuntary exposure to smoke from burning incense, these findings carry significant public health implications." In 2015, the South China University of Technology found toxicity of incense to Chinese hamsters' ovarian cells to be even higher than cigarettes. ^ Cunningham's Encyclopedia of magical herbs. Llewellyn Worldwide. 2000. ISBN 978-0-87542-122-3. ^ a b c d "Making Incense by David Oller". baieido-usa.com. Retrieved 2018-06-16. ^ "官方網站" [Shang Xiang Si tak]. 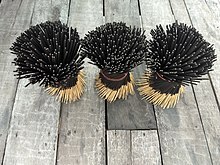 Incenseart.org.tw (in Chinese). 中華東方香學研究會 [Chinese Incense Art Association]. Retrieved 2016-07-20. ^ Adrienne Borden; Steve Coyote. "The Smudging Ceremony". ^ "Incense blending contents". ancientworlds.net. April 28, 2004. Archived from the original on June 14, 2011. ^ "How to Make Incense". Scents-of-earth.com. Retrieved 2016-07-20. ^ Ian MacKinnon (30 July 2008). "Burning joss sticks 'as deadly as traffic fumes or cigarette smoke'". theguardian.com. ^ "Joss | Define Joss at Dictionary.com". Dictionary.reference.com. Retrieved 2016-07-20. ^ Harper, Douglas. "joss". Online Etymology Dictionary. ^ "Incense - United States". Orthodox Incense. 2013-08-12. Retrieved 2016-07-20. ^ "Incense". OrthodoxWiki.org. 2011-11-06. Retrieved 2016-07-20. ^ "雲霄古道／溫蕉厝的剖香腳". YouTube. Retrieved 2016-07-20. ^ "YouTube". YouTube. Retrieved 2016-07-20. ^ "Making Incense". YouTube. 2006-12-18. Retrieved 2016-07-20. ^ "台灣宏觀電視TMACTV 代代相傳 新港香". YouTube. Retrieved 2016-07-20. ^ "製香過程". YouTube. 2009-07-20. Retrieved 2016-07-20. ^ P. Morrisroe. Transcribed by Kevin Cawley. "Catholic Encyclopedia". 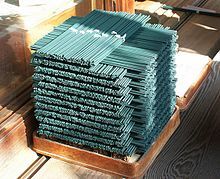 ^ Japanese-Incense. "Buddhist Incense – Sonae ko". ^ "Incense Around The World". Vienna Imports. ^ Bedini, Silvio A. (1963). "The Scent of Time. A Study of the Use of Fire and Incense for Time Measurement in Oriental Countries". Transactions of the American Philosophical Society. 53 (5): 1–51. doi:10.2307/1005923. JSTOR 1005923. ^ Schafer, Edward H. (1963). The Golden Peaches of Samarkand, a Study of T'ang Exotics. University of California Press. p. 155. ^ TOP. "不燒香 法鼓山行之有年 | 生活 | 中央社即時新聞 CNA NEWS". Cna.com.tw. Retrieved 2016-07-20. ^ "我們都誤會行天宮了 | 即時新聞 | 20140901 | 蘋果日報". Appledaily.com.tw. Retrieved 2016-07-20. ^ 作者：廣興. "香港宝莲禅寺佛教文化传播网". Hk.plm.org.cn. Retrieved 2016-07-20. ^ "全球买家•缅甸 缅甸：谈生意莫选星期二". Ycwb.com. 2005-11-14. Retrieved 2016-07-20. ^ "Incense Sticks Manufacturers, Suppliers and Exporters | Moksh". Mokshagarbatti.com. 2014-06-20. Retrieved 2016-07-20. ^ a b c Herrera, Matthew D. (2011). "Holy Smoke: The Use of Incense in the Catholic Church" (PDF). San Luis Obispo: Tixlini Scriptorium. Archived from the original (PDF) on 2012-09-12. ^ Silvio A. Bedini. "Time Measurement With Incense in Japan". ^ Sanchez, David M. "10 Physical and Psychological Benefits Of Burning Incense". Tao de Wan. Retrieved 2019-02-12. ^ Siao Wei See; Rajasekhar Balasubramanian; Umid Man Joshi (2007). "Physical characteristics of nanoparticles emitted from incense smoke". Science and Technology of Advanced Materials. 8 (1–2): 25–32. Bibcode:2007STAdM...8...25S. doi:10.1016/j.stam.2006.11.016. ^ Lin JM, Wang LH (September 1994). "Gaseous aliphatic aldehydes in Chinese incense smoke". Bulletin of Environmental Contamination and Toxicology. 53 (3): 374–381. doi:10.1007/bf00197229. ISSN 0007-4861. PMID 7919714. ^ Ger LP, Hsu WL, Chen KT, Chen CJ (1993). "Risk factors of lung cancer by histological category in Taiwan". Anticancer Res. 13 (5A): 1491–500. PMID 8239527. ^ Koo, Linda C.; Ho, J.H-C.; Tominaga, Suketami; Matsushita, Hidetsuru; Matsuki, Hideaki; Shimizu, Hiroyuki; Mori, Toru (1995-11-01). "Is Chinese Incense Smoke Hazardous to Respiratory Health? : Epidemiological Results from Hong Kong". Indoor and Built Environment. 4 (6): 334–343. doi:10.1177/1420326X9500400604. ^ "Burning incense linked to respiratory cancers". Reuters. 2008-08-25. Retrieved 2016-07-20. ^ Zhou, R.; An, Q.; Pan, X. W.; Yang, B.; Hu, J.; Wang, Y. H. (2015). "Higher cytotoxicity and genotoxicity of burning incense than cigarette". Environmental Chemistry Letters. 13 (4): 465–471. doi:10.1007/s10311-015-0521-7. ^ Moussaieff A, Rimmerman N, Bregman T, et al. (August 2008). "Incensole acetate, an incense component, elicits psychoactivity by activating TRPV3 channels in the brain". FASEB J. 22 (8): 3024–34. doi:10.1096/fj.07-101865. PMC 2493463. PMID 18492727.